We provide a complete range of quality dry cleaning service ranging from your regular suits dress to delicate item like silk embodied and sequined. We also provide a complete washing service including duvets, pillow, shirts, bed linen, table linen etc. These would be washed and pressed ready for use. If you just want them to have them pressed we can provide an iron service which would be pressed and hanged or folded, which ever suits you. 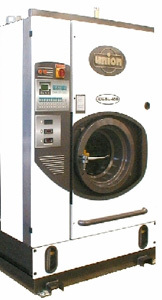 All our drycleaning machinery is brand new and made buy Union who are the leader in dry cleaning machines. Supplied by parrisaine. A full alteration service is available including trousers length shorting, waists taken in; jackets arm length shorting, zips replacing and buttons restitched.